Hand-crafted 8x10 Clapboard Classic Cottage measures 8' by 10' and comes equipped with a set of double doors with locking door handle. 2 single windows with screens and Z pattern shutters. 8’ wide sheds have a 4’6” door opening, 10’ wide sheds have a 5’door opening, and 12’ wide sheds have a 6’door opening. Doors and windows can be placed according to customer’s request. Clapboard Classic Cottage Models feature 79" walls, 24" x 36" windows, shutters, 7/12 roof pitch, 8" overhangs and vents. Take this home for only $254.45 with a 36-month Rental Agreement from BLI Rent To Own, based on an initial purchase price of $3,335.00. Your initial payment of $254.45 includes a security deposit of 100.05 and your first month's rental payment of $154.40. Ask about 90 days same as cash! Model shown in photo is finished with mushroom stain, white trim, white doors and dark brown architectural shingles. Hand-crafted 8x12 Clapboard Classic Cottage measures 8' by 12' and comes equipped with a set of double doors with locking door handle. 2 single windows with screens and Z pattern shutters. 8’ wide sheds have a 4’6” door opening, 10’ wide sheds have a 5’door opening, and 12’ wide sheds have a 6’door opening. Doors and windows can be placed according to customer’s request. Clapboard Classic Cottage Models feature 79" walls, 24" x 36" windows, shutters, 7/12 roof pitch, 8" overhangs and vents. Take this home for only $287.41 with a 36-month Rental Agreement from BLI Rent To Own, based on an initial purchase price of $3,767.00. Your initial payment of $287.41 includes a security deposit of 113.01 and your first month's rental payment of $174.40. Ask about 90 days same as cash! Hand-crafted 10x10 Clapboard Classic Cottage measures 10' by 10' and comes equipped with a set of double doors with locking door handle. 2 single windows with screens and Z pattern shutters. 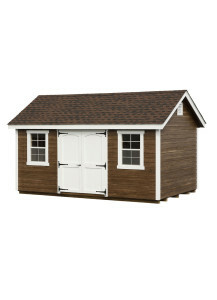 8’ wide sheds have a 4’6” door opening, 10’ wide sheds have a 5’door opening, and 12’ wide sheds have a 6’door opening. Doors and windows can be placed according to customer’s request. Clapboard Classic Cottage Models feature 79" walls, 24" x 36" windows, shutters, 7/12 roof pitch, 8" overhangs and vents. Take this home for only $305.72 with a 36-month Rental Agreement from BLI Rent To Own, based on an initial purchase price of $4,007.00. Your initial payment of $305.72 includes a security deposit of 120.21 and your first month's rental payment of $185.51. Ask about 90 days same as cash! Hand-crafted 10x12 Clapboard Classic Cottage measures 10' by 12' and comes equipped with a set of double doors with locking door handle. 2 single windows with screens and Z pattern shutters. 8’ wide sheds have a 4’6” door opening, 10’ wide sheds have a 5’door opening, and 12’ wide sheds have a 6’door opening. Doors and windows can be placed according to customer’s request. Clapboard Classic Cottage Models feature 79" walls, 24" x 36" windows, shutters, 7/12 roof pitch, 8" overhangs and vents. Take this home for only $336.77 with a 36-month Rental Agreement from BLI Rent To Own, based on an initial purchase price of $4,414.00. Your initial payment of $336.77 includes a security deposit of 132.42 and your first month's rental payment of $204.35. Ask about 90 days same as cash! Hand-crafted 10x14 Clapboard Classic Cottage measures 10' by 14' and comes equipped with a set of double doors with locking door handle. 2 single windows with screens and Z pattern shutters. 8’ wide sheds have a 4’6” door opening, 10’ wide sheds have a 5’door opening, and 12’ wide sheds have a 6’door opening. Doors and windows can be placed according to customer’s request. Clapboard Classic Cottage Models feature 79" walls, 24" x 36" windows, shutters, 7/12 roof pitch, 8" overhangs and vents. Take this home for only $363.25 with a 36-month Rental Agreement from BLI Rent To Own, based on an initial purchase price of $4,761.00. Your initial payment of $363.25 includes a security deposit of 142.83 and your first month's rental payment of $220.42. Ask about 90 days same as cash! Hand-crafted 12x12 Clapboard Classic Cottage measures 12' by 12' and comes equipped with a set of double doors with locking door handle. 2 single windows with screens and Z pattern shutters. 8’ wide sheds have a 4’6” door opening, 10’ wide sheds have a 5’door opening, and 12’ wide sheds have a 6’door opening. Doors and windows can be placed according to customer’s request. Clapboard Classic Cottage Models feature 79" walls, 24" x 36" windows, shutters, 7/12 roof pitch, 8" overhangs and vents. Take this home for only $384.00 with a 36-month Rental Agreement from BLI Rent To Own, based on an initial purchase price of $5,033.00. Your initial payment of $384.00 includes a security deposit of 150.99 and your first month's rental payment of $233.01. Ask about 90 days same as cash! Hand-crafted 10x16 Clapboard Classic Cottage measures 10' by 16' and comes equipped with a set of double doors with locking door handle. 2 single windows with screens and Z pattern shutters. 8’ wide sheds have a 4’6” door opening, 10’ wide sheds have a 5’door opening, and 12’ wide sheds have a 6’door opening. Doors and windows can be placed according to customer’s request. Clapboard Classic Cottage Models feature 79" walls, 24" x 36" windows, shutters, 7/12 roof pitch, 8" overhangs and vents. Take this home for only $386.90 with a 36-month Rental Agreement from BLI Rent To Own, based on an initial purchase price of $5,071.00. Your initial payment of $386.90 includes a security deposit of 152.13 and your first month's rental payment of $234.77. Ask about 90 days same as cash! Hand-crafted 12x14 Clapboard Classic Cottage measures 12' by 14' and comes equipped with a set of double doors with locking door handle. 2 single windows with screens and Z pattern shutters. 8’ wide sheds have a 4’6” door opening, 10’ wide sheds have a 5’door opening, and 12’ wide sheds have a 6’door opening. Doors and windows can be placed according to customer’s request. Clapboard Classic Cottage Models feature 79" walls, 24" x 36" windows, shutters, 7/12 roof pitch, 8" overhangs and vents. Take this home for only $407.19 with a 36-month Rental Agreement from BLI Rent To Own, based on an initial purchase price of $5,337.00. Your initial payment of $407.19 includes a security deposit of 160.11 and your first month's rental payment of $247.08. Ask about 90 days same as cash! Hand-crafted 12x16 Clapboard Classic Cottage measures 12' by 16' and comes equipped with a set of double doors with locking door handle. 2 single windows with screens and Z pattern shutters. 8’ wide sheds have a 4’6” door opening, 10’ wide sheds have a 5’door opening, and 12’ wide sheds have a 6’door opening. Doors and windows can be placed according to customer’s request. Clapboard Classic Cottage Models feature 79" walls, 24" x 36" windows, shutters, 7/12 roof pitch, 8" overhangs and vents. Take this home for only $430.54 with a 36-month Rental Agreement from BLI Rent To Own, based on an initial purchase price of $5,643.00. Your initial payment of $430.54 includes a security deposit of 169.29 and your first month's rental payment of $261.25. Ask about 90 days same as cash!